I ran across a butterfly card on Pinterest and I didn't want to go through all the work so I tried a short cut. I should have gone through the work!!! LOL You can see the original card here. I did not use the same colors because I didn't purchase the in colors this time around. The base of the card is a folded half-sheet of Daffodil Delight card stock. This card was cut in half on the 8-1/2" side and it opens at the bottom. I added a 4" x 5-1/4" piece of Whisper White card stock to the top of the card base. I cut the gingham Designer Series Paper (DSP) 1-1/4" x 1-1/4" each. I taped them in place using snail tape. 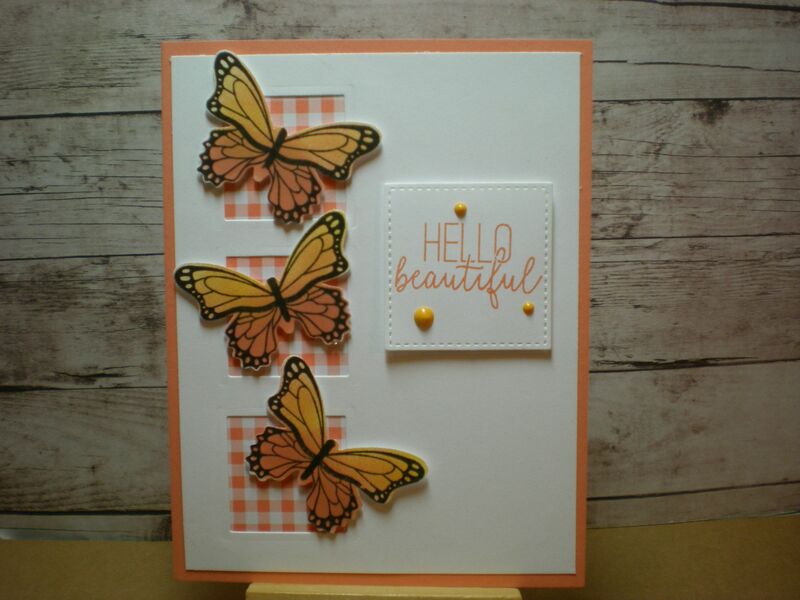 I stamped the butterflies from the "Butterfly Gala" stamp set using black Memento ink. I colored the top part of the butterfly using the light Pumpkin Pie Blends pen and I used the other Pumpkin Pie Blends marker for the bottom part. I punched them out with the matching punch. I set them in place using Dimensionals. The words are from the "Beautiful Bouquet" set using black Memento ink. I die cut the words using the square stitched framelits. That square measures about 1-5/8" x 1-5/8". I set the square in place using Dimensionals and I added some enamel dots to it. The original card die cut the three squares on the left and put the DSP behind it. I didn't want to do all of that measuring to get the die straight and hope it didn't move in the Big Shot while going through. So I took the short cut and am not thrilled with the card but it's okay. If I were to do this again I think I would have layered the DSP squares with Basic Black card stock and the word piece too. I do like the butterflies. And I do have to say, I did have fun making this card. I think your card is adorable.